Recipe from Lee Anne Mills, Senior Marketing Manager, Wal-Mart. This is a basic recipe for making a healthy tossed salad, but where you take it from here is really up to you — nearly anything can be added in for more flavor and fun! 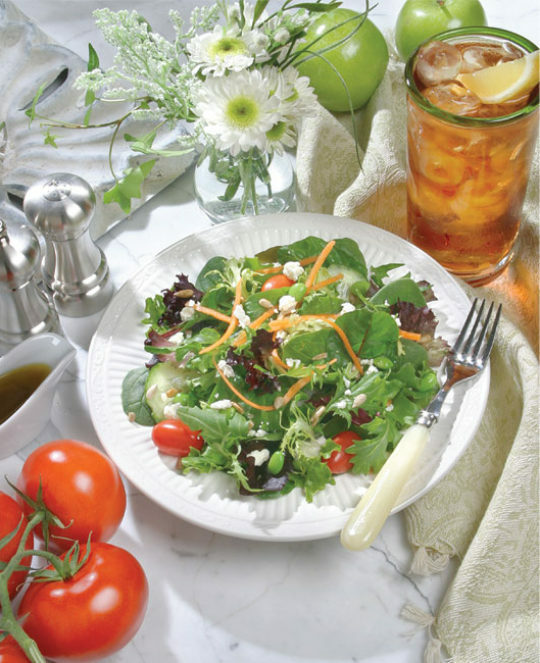 What you include in your spring salad is up to you. We’ve included a few ideas below to get you started. Feel free to mix and match your favorites and toss them into your salad. You can include baby greens, arugula, radicchio, Boston red leaf, baby spinach, romaine, Bibb — anything but iceberg works! We used 12 cups of greens. We love cherry tomatoes, carrots, celery, chopped fennel (the white part), cucumber, frozen peas, edamame. We used 4 cups of veggies. Try fresh pears, apples, grapes or dried cherries, cranberries, raisins, figs, dates, whatever you have on hand. Don't forget the berries, fresh blueberries, raspberries and strawberries. We used 3 cups of fruits. Use sparingly for flavor without adding fat. Consider low-fat varieties of goat, feta, bleu, gorgonzola, Asiago. Consider serving separately so it can be lightly sprinkled on the individual salad (you’ll use less this way, and keep the fat content to a minimum). Combine in a cruet and shake. Refrigerate unused portion for best results. Nutritional analysis will vary based on ingredients and amounts used.